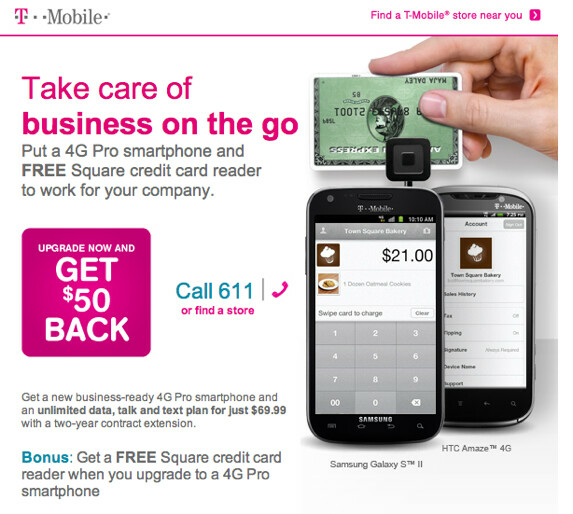 T-Mobile has a Square deal for its business customers looking to upgrade to 4G. Those moving up to a 4G Pro smartphone will get the chance to lock up unlimited talk, text and data for 2-years at a price of $69.99 per month. If a business customer takes advantage of the offers and grabs a new 4G Pro smartphone and the unlimited rate plan, he will also receive for free, a Square mobile credit card reader. Also, for a limited time the carrier is offering a $50 rebate to those who upgrade now. The Square app, which is also available free from the Android Market (the reader must be ordered separately), allows merchants to swipe a credit card and receive an authorization number no matter where they are, as long as they have a signal on their smartphone. For those whose business takes them out of the office, this is a must have application that makes conducting business on the go a lot easier. 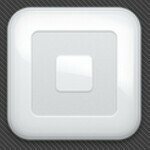 For Square, this is their first promotion with a carrier. The service and reader can now be purchased at 9,000 retail locations including those belonging to Apple, Best Buy, Radio Shack, Target and Walmart. The company processes some $11 million in transactions daily, a number that is only going to grow higher. Last month, Square 2.2 was released which allows vendors to print receipts and also offer special deals to repeat buyers. Customers will receive these deals from the Square Card Case app which tracks the stores that use Square. On the other hand, we are not sure what T-Mobile is giving away here. When you install the app from the Android Market, you can follow instructions on how to order the reader for free. And if you do buy the reader from one of the stores that offers it, you get a coupon good for the price that you paid for it. Let's go with the idea that T-Mobile is making things easier for you by giving you the mobile reader without you having to order or buy one. Accessory is only $9.99 normally. But I guess free is better. i have square up for 2 months now. and they canceled my account due to suspicious transactions. they asked all these weird questions and proof, i did not comply and they canceled it on the spot.